Nintendo has announced that people who buy the Nintendo Switch system will be able to participate in a special Splatoon 2 preview. 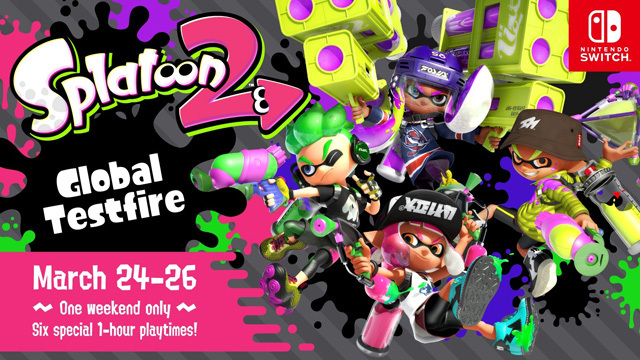 Owners with internet access can download a demo version of the Splatoon 2 game that will allow them to battle against opponents around the world in the Splatoon 2 Global Testfire event. It’s a way for everyone to investigate the latest in cephalopod warfare months before the game launches! In addition to the Testfire event, Nintendo squid expert and Splatoon 2 producer Hisashi Nogami also confirmed a new way for players to follow the action when the game launches later in the year – a mode that will give players a unique insight into squid behaviors and strategy called Private Battle Spectator View. This breakthrough in squid-observation technology will allow up to two non-players to participate in a Private Battle as camera operators to observe all the action from multiple angles. In addition to this, a new feature called LAN Play will be added to Splatoon 2, allowing up to 10 docked systems – eight players and two spectators – to connect via wired LAN. This feature allows players to create local Private Battle tournaments without the need for an internet connection. Local wireless play is perfect for your regular gaming get-togethers, but LAN Play is where it’s at when you want to organize a serious tournament event with your fellow players. “Two years have passed in this universe since the original Splatoon, and since then, the weapons, maps and characters have evolved. 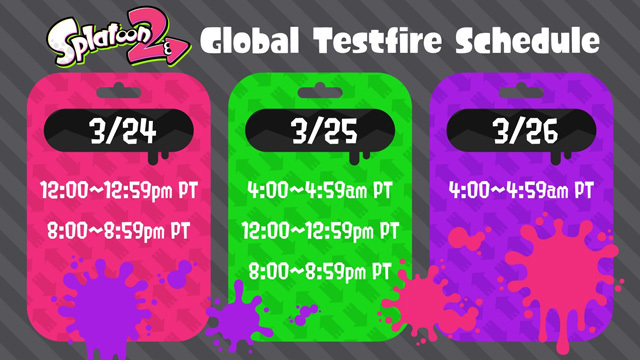 Through the Splatoon 2 Global Testfire event this March, players will be able to get a taste of that. There will be more new features to experience in Splatoon 2, so please look forward to more reveals in the future,” noted Mr. Nogami. All indications are that the content for the Global Testfire will allow players to test four different main weapons, including the new Splat Dualies, as well as remixed versions of the iconic Splat Roller and Splat Charger. Nintendo also revealed that Splatoon 2 will be compatible with Splatoon series amiibo figures and, for the first time in the series, with an upcoming Nintendo Switch app for smart devices that enhances online play. This app will connect to the game and allow players to set play appointments with friends and teammates who have been added to their Nintendo Switch friend list or via their social media accounts. It also allows players to match up with those friends directly in the game or voice chat with them via their smart device. For example, during a Private Battle, players can voice chat with all of their connected friends when they divide into teams, but once teams are set, voice chat is switched to communication only between teammates on the same team. In order to use this app, players need to link their Nintendo Account to their Nintendo Switch system and have a smart device capable of in-game voice chat. Nintendo Switch launches March 3 at a suggested retail price of $299.99.